Discussion in 'NASCAR chat' started by Zeck, Feb 18, 2015. I'll give it 8.5/10. Better than before. Think Harvick's my favorite so far, sleek looking. Is kyle busch driving the same ugly yellow m&m car he always drives? It would be nice to see him switch it up. It looks more like a candy wrapper then a race car. I liked his green crispy one in 2015, best m&m one imo. You mean like that jacket in your avatar? 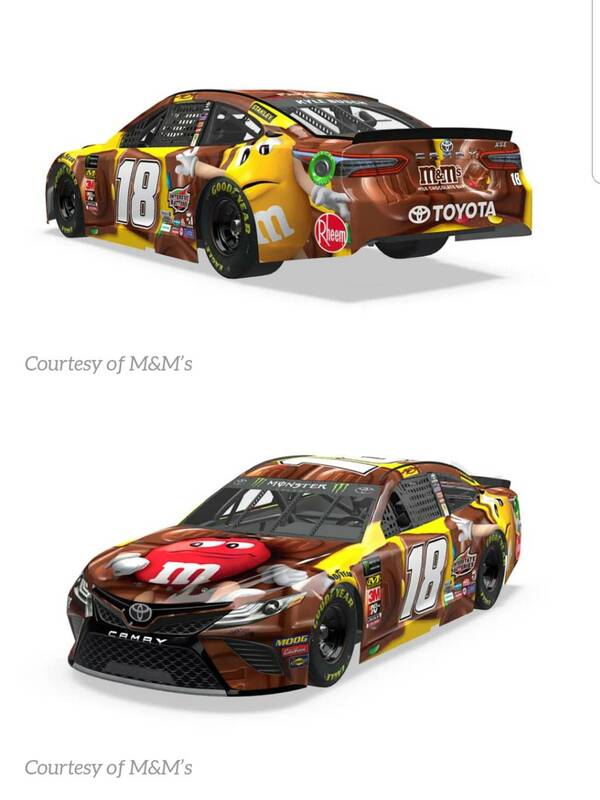 Maybe that's point, but I see nothing wrong with the yellow, that's been the primary color Mar's has used for the majority of time they have been in NASCAR with the M&M's brand. Kiante and 2 Sweet like this. How the he’ll did Ryan preece take AJ job?!!! And how the he’ll isnt AJ driving ? This is crazy.. preece isn’t better then AJ! Well, it was just time. AJ was not bad at all after the crew chief change they had, but it was just time for both sides to move on. Preece I think still has potential, but with this new agreement with HMS will be a big plus with JTG. I would have liked to see AJ with the new contract, but I guess it was time for a change for both sides. Turtle84 and Johali like this. The 18 had 20 paint schemes last year. Chicagoland winning car, and Darlington Throwback car are his best by far. The rest are awful. I like the black skittles one the best out of those. red skittles, white m&m, and interstate batteries are decent too imo. The M&Ms Caramel and Interstate Batteries ones are pretty neat. The Darlington Skittles throwback was also cool. 2 Sweet, 2019PensekeFan and Johali like this. Team Penske and Fordracing7 like this. I really like the 11 and the Hooters scheme. But KDB's looks like someone just threw a decent amount of sh!t on his car. jws926, DWDawg, Fordracing7 and 2 others like this. Even the gf said "Eww"
Blaze, donthaveanickname, dirtfan and 1 other person like this. where his RC skills will be in demand. This, IMO, is the cleanest best looking car in Cup. Larsonfan1995 and Fordracing7 like this. Getting into that 22 after Kurt's rage issues was his big shot with elite equipment, unfortunately cut short with AJ's drug suspension we never really got the chance to see what he could do on a consistent basis imo, ultimately that suspension led to the birth of the true LOGANO. Nope, some of his cars I do like, some I don't. I normally like anything he has that are Skittles, those look really badass. A lot of the M&M cars tho, just look plain ugly as hell. Nothing to do with the driver. Hell, I didn't like some of the cars Jr had and he was my favorite driver. 2 Sweet, Fordracing7 and Turtle84 like this. Fordracing7, 2 Sweet and Kiante like this. Medical Field uses markers in many forms for testing. It's a good concept. Fordracing7 and 2 Sweet like this. Agreed. A good looking race car looks good no matter who is behind the wheel, and a bad looking race car still looks bad even with my favorite driver in it. The M&M's paint scheme has always looked ugly IMO, even with Ken Schrader and Ernie Irvan who are two of my favorites. Johali, Fordracing7 and Blaze like this. Wtf why? Jesus Christ, somebody punch whoever approved this. jws926, Turtle84, donthaveanickname and 1 other person like this. Haha. Man I saw this car last Thursday when I stopped at HMS. I noticed the Team Rubicon on the quarter panel and was oh ok cool, a new sponsor even tho it looks like crap compared to having "Mtn Dew" in that spot. The camo however was not visible at all from where I was standing. This hurt my soul when I saw this ugly crap lol. Fordracing7 and Turtle84 like this.